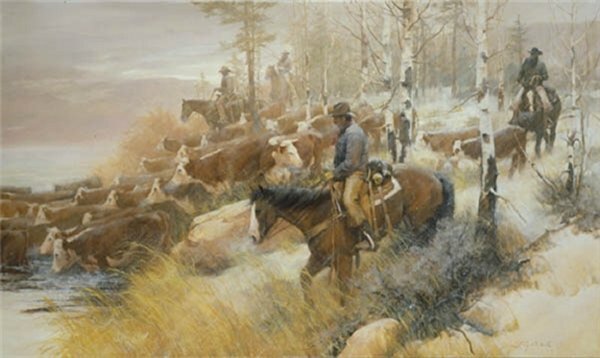 Arizona artist Howard Rogers paints the West and the men who call it home. His soft, almost romantic, handling of his subjects makes even the most mundane chore seem new and exciting. Working cowboys herd cattle across a stream as the chill of November bites into them. But, what scene could be more masculine in appeal than this? The warm cattle and horses contrast nicely with the men who probably are enjoying the crisp temperature less than their counterparts.